Despite getting 20 points from Bradley Beal in the first half, the Wizards were unable to defeat the Hornets in Buzz City, falling to the Hornets 123-110. 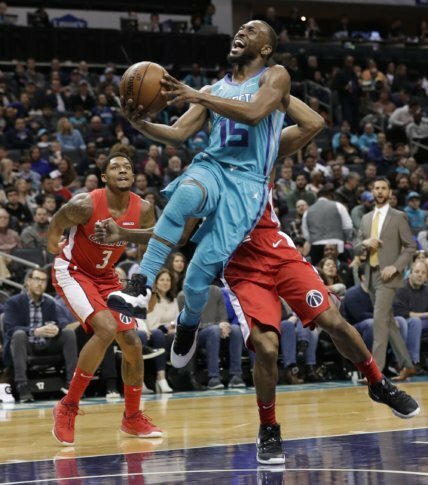 Despite getting 20 points from Bradley Beal in the first half, the Wizards were unable to defeat the Hornets in Buzz City, falling to the Hornets 123-110. Beal finished with 46 points, seven assists and six rebounds, including scoring a 3-pointer for the 36th straight game. Bradley Beal moving on from the All-Star nod to making All-NBA noise. Crushing here. Beal brought the Wizards back within ten with less than six minutes to play in regulation. He has now scored at least 20 points in 13 straight games. Jeff Green finished with 16, Tomas Satoransky added 15, and Bobby Portis secured the double-double with a dozen points and a dozen boards. Kemba Walker led the Hornets with 27 points as well as 11 assists. One thing you should know about the game: Beal is now tied with Earl Monroe for 5th in Wizards-Bullets history for most 40-point games with 10. The guys ahead of him? Elvin Hayes with 11, Bernard King with 13, Walt Bellamy with 23, and Gilbert Arenas with 28. The Wizards host the Pacers tomorrow evening at Capital One Arena, hoping to make their playoff push a reality.